I stumbled today across this new video on The Guardian website from Akala. “The propaganda of ‘British Values’ is a distortion of history. What does it mean to be British? Many things have apparently come to define British values Winston Churchill, the monarchy, Empire, received pronunciation, aristocracy, whiteness. But some of the people of this island have a much more interesting, subversive, countercultural set of traditions buried beneath the surface. These traditions don’t fit the elites message that they alone are responsible for everything that’s good in society. Therefore it’s no surprise that most of us learn more at school about Henry VIII’s marital dramas that we do about the Peterloo Massacre. These are the traditions embodied by striking miners, peasants revolting against private tyranny and by the suffragettes. Also embodied by William Cuffay (Kofi) the disabled black man from Kent who lead the 19th Century Chartist movement for free speech. A tradition embodied by the John Brown Women’s society from Sheffield, who refused to make manacles for factories that supported slavery, but because they were poor and women to boot, their names have vanished into history. A tradition whose legacies include Notting Hill Carnival, Europe’s largest street festival, which was born out of multicultural, anti-racist activism in what was, 50 years ago, one of London’s poorest areas. Today these traditions are embodied by activists, youth workers, school teachers and nurses that go that extra mile for the people they are trying to serve. These traditions have often been persecuted and even labelled anti-British or anti-state until they bear fruit that the state then wants to claim for itself, such as poor people getting the right to vote or the abolition of child labour. These gains are then presented as the result of inherent British values rather than as the results of serious political struggle that they in fact were. Whilst I’m not a nationalist, how national peoples and cultures see themselves undoubtedly has real world implications. The question in these tumultuous times, is which of the traditions of the people of this island will you be drawing on and identifying with? The one that promotes and reinforces race and class oppression and explains away the genocide of Empire as a civilising mission? Or, the one of relentless activism that secured for us the very fragile freedoms that we have today. “It is said, of course that we have no capital, no industrial skill, no communications, no internal markets, and that we cannot even agree among ourselves how best to utilise our resources for our own social needs. “Yet all the stock exchanges in the world are pre-occupied with Africa’s gold, diamonds, uranium, platinum, copper and iron ores. Our CAPITAL flows out in streams to irrigate the whole system of Western economy. Fifty-two per cent of the gold in Fort Knox at this moment, where the USA stores its bullion, is believed to have originated from OUR shores. Africa provides more than 60 per cent of the world’s gold. A great deal of the uranium for nuclear power, of copper for electronics, of titanium for supersonic projectiles, of iron and steel for heavy industries, of other minerals and raw materials for lighter industries – the basic economic might of the foreign Powers – comes from OUR continent. Last week I walked in on a conversation between my friends where we live (for the moment) just outside of Accra, Ghana. “Ghana ye hye – Ghana is hot” one of them said to me. After some initial confusion (it was a cool day), they explained; “Pure water sachets are going up to 30 pesewas.” That’s a 50% increase. After a quick news search I found out that from today (1st February) a sachet of water will go up from 20 pesewas to 30 pesewas and a bag of sachet water will sell at 5 Ghana cedis (an increase of 1 cedis 50 pesewas). I asked them how they were feeling; “worried” was the instant reply; and then: “in our own land there is no peace”; “it’s impossible to sleep at night” and (laughing) “we’ll have to move to Togo”. My friends are 24 years old and already fed up of politics, President Mahama and his party NDC, who have presided over an increasing number of price hikes and taxes; water by 67%, electricity by 59% and fuel by 28% – all the basic staples required to keep a country and its people running. In 2010 Ghana drilled for oil, but last year the IMF forced deregulation and the end of government subsidies and fuel prices increased by 13% in May, 4% in June and 15% in July. If the fuel prices go up, the cost of everything goes up. Except wages of course. This sentence stopped me in my tracks. I re-read it a few times, feeling a growing sense of frustration at the easy way hundreds of years of often oppressive and defining history can be erased in a single sentence; how easy it is to slip into comfortable neoliberal, imperial narratives. I believe it does Ghanaians a huge disservice to place full accountability for their economic, political and societal problems at the feet of corrupt national governance and the autonomy of markets. I feel that the article has misplaced what is, in fact, a nuanced accountability for the crisis by failing to look at the historical and conscious international systemic contexts that Ghana exists within. Yes the Governance here is problematic, but this is a problem that is compounded and perpetuated by external and historical factors. The dominant reason for the scramble and partitioning of Africa at the Berlin Conference in 1884-85 was economic exploitation. Namely, as articulated by Jules Ferry, the then Premier of France in 1885: to have free access to raw materials of the colonies; to have ready made markets for the sale of manufactured goods of the colonising countries, and; to use the colonies as fields for investment of surplus capital. Today, agriculture accounts for approximately 42% of Ghana’s GDP and employs 54% of its workforce. Despite some diversification, cocoa still remains the primary export. It is this imposed over-reliance on export cash crops and raw materials that has left Ghana so vulnerable to the effects of the plummeting global commodity prices. The export revenues for cocoa, oil and gold declined from $8.2bn between January and September 2014 to $5.8bn just a year later. This vulnerability is further compounded by the fact that Ghana is still operating primarily as a producer of raw agricultural product (e.g. cocoa, cotton, palm oil etc), which is then transported abroad to be processed. Without the infrastructure to process the products, Ghanaians are forced to re-import the processed results of their raw products back into the country – much of the chocolate and cotton fabric sold here has been processed elsewhere, transported back and sold at a profit – which is galling. Few African countries process their own raw materials – rather, the value is added elsewhere, for the benefit of others. I’ve only very briefly touched on Ghana’s colonial past here – it’s almost impossible to ever do it justice, but I recommend reading Walter Rodney’s ‘How Europe Underdeveloped Africa’ for an eye-opening account. To think that Western governments, corporations and elites have ‘evolved’ beyond colonialism and exploitation today is evidently absurd – a quick Google of words like ‘foreign’, ‘exploitation’, resources’, ‘Ghana’, will bring up a range of news articles. Despite independence in 1957, the legacy of European colonialism across the African continent lives on and is today joined by neo-colonialism in the form of intervention from the US, China and foreign corporations, particularly when it comes to raw materials. Not only are Ghanaians suffering from the effects of neoliberalism and imperialism with the destruction of their environment, they are then also missing out on any much-needed revenue generated by it. Instead the money resulting from the looting of their natural resources is going straight into the pockets of foreign companies who are focussed solely on making and repatriating profit. China’s burgeoning relationship with Ghana has been problematic from the start; not only because there are a huge number of (largely) Chinese companies operating here illegally, but also because Chinese investment in Ghana has caused the collapse of Ghana’s manufacturing sector; proliferation of small arms in gold mining cities as a result of illegal mining activities; and increased unemployment due to the export of Ghanaian jobs to China through over-reliance on Chinese goods and services. Oh, and China is certainly not the only country playing this game – mining by foreign multinationals (as well as local companies I’m sure) displaces hundreds of thousands of people, destroys farm and forest land, and contaminates water supplies and pollutes the air causing disease and poor health. The problem extends far beyond raw materials too; the desperation to attract Foreign Direct Investment has also left Ghana missing out on much needed finance. In 2008 the European multinational company Vodafone purchased a 70% stake in Ghana Telecom and, under the Sales Purchase Agreement, enjoyed a five year holiday from paying tax to the government. During that period the company made huge profits, all of which have gone to shareholders while Ghana saw very little, including little improvement to service quality (and in fact Vodafone prices have just gone up). One such example of their involvement is the three-year electricity ‘crisis’ that Ghana is still in the midst of (‘dumsor’, or power blackouts have been a daily reality here for the duration). The IMF blames the power cuts on “lower rainfall on hydroelectric power generations and disruptions to the supply of gas from Nigeria,” but there is much evidence to suggest that the organisation itself is at least partly responsible. Former UK diplomat Craig Murray wrote last year that Ghana once had “the most reliable electricity supply in all of Africa and the highest percentage of households connected to the grid in all of Africa”. Murray believes that the success of this publicly owned and run enterprise posed too much of a threat to the neoliberal ideology of the World Bank and the IMF, and so, when Ghana needed some temporary financial assistance (against what he calls a ‘generally healthy background’), the IMF insisted that the Volta Region Authority be broken up. This resulted in the separation of electricity into production and distribution and the introduction of private sector Independent Power Producers to the market. You only have to have spent a few days here over the past few years to know that the situation is a disaster for homes, public services and businesses that need a reliable power supply, especially as running a generator is so expensive (although the supply has seemed to be more consistent this year for those who can afford it…). According to Murray, there have been more power cuts in the country than ever in its history as an independent state. He claims that in July last year Ghana was producing 900 MW of electricity, which is half of what it was able to produce ten years ago, and suggests that the (mostly foreign owned and foreign financed) private sector Independent Power Producers were providing less than 20% of the electricity generation to the grid, but taking over 60% of the revenues. The IMF has just approved a third disbursement of $114.6 million to ‘help tackle Ghana’s economic recovery’, which will undoubtedly see the country face further hardship while it tries to meet the IMF’s strict conditionality in order to ‘restore fiscal discipline and macroeconomic stability’. In the 1980s, implementation of the IMF’s ‘conditionality’ saw much needed subsidies wiped and public sector jobs cut while wages were kept low – under austerity many suffered. What IS so generous of the IMF (note the sarcasm) is that is has been considerate enough to offer “technical assistance and capacity-building” to Ghana with the opening of its fifth Regional Training Center in Accra. Lagarde states that the purpose of the centre is to offer ‘surveillance’ and try to ensure policy that is “more sophisticated, better adjusted to the new economy, more connected, more balance between the various regions and areas of the world” (Read: to ensure Ghana is behaving itself). Ghana is a resource rich country. Aside from vast agricultural production, it also BLEEDS gold. You might ask yourself how a country built upon gold can be indebted to the rest of the world; but it is in debt… to the sum of 90bn cedis (£16bn), which, coupled with an apparent rise in public spending, gives the country a debt-to-gross domestic product ratio of more than 70%. Today’s debt crisis in Ghana is unsurprising given the scale of lending to them still taking place and their dependence on fluctuating commodities. However, this debt is further compounded by the devaluing of Ghana’s currency which, in turn increases the real size of its debts. Debts owed outside the country are valued in dollars or other foreign currencies, so a fall in exchange rate will immediately increase the relative size of debt repayments in domestic currency – a big risk of borrowing in foreign currencies. Even money leant by multilateral institutions like the World Bank and other governments carries this risk because the loans are given in dollars – even though they claim they are ‘risk free’ with a low interest rate of around 0.5% for the most impoverished countries. Between 2004 and 2013, Ghana was lent $2.8 billion by the World Bank, which totalled 3.8 billion Ghanaian Cedis. However, the fall in the Ghanaian Cedi now means that, based on current exchange rates, Ghana will pay back 12.8 billion Cedis, three times more what was lent. 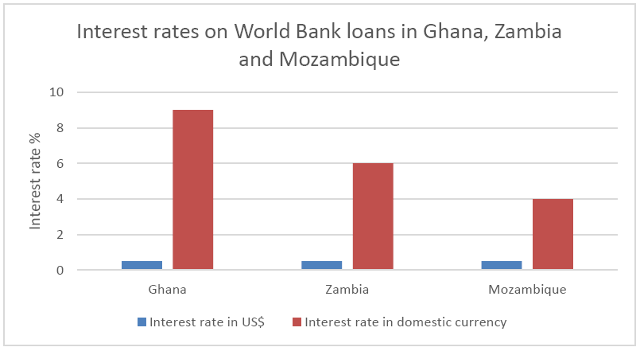 The effective interest rate Ghana is now paying on these World Bank loans is 9%. The same applies to loans given to Ghana by foreign private financial markets, through bonds usually issued under English law. In 2013 Ghana borrowed $750 million through a 10-year bond in at an 8% interest rate. Due to the real cost payments increasing with the fall in exchange rates, the Jubilee Debt Campaign calculates that the effective interest rate for Ghana on these bonds is now 27%. Once again Ghana, which spent over 30% of government revenue on debt payments in 2015, is at the mercy of the IMF, which ‘came to the rescue’ in April last year with a $918m three-year assistance programme to enable these debts to be paid. Essentially the programme equals more debt…and a hell of a lot of pressure on the government to create increase austerity within the country and to create the right conditions for external market forces. It’s important to recognise that the costs of the commodity price and exchange rate falls are being borne by the people of Ghana and citizens of other countries in similar positions, and not by the lenders, whether that be the IMF, World Bank, private speculators or others. Economic growth will not improve things for Ghanaians – in general those countries heavily dependent on foreign lending grow faster than the average for low income countries, but they make less progress on reducing poverty and inequality is increasing, as this report from the Jubilee Debt campaign demonstrates. My intention with this article isn’t to remove accountability or blame from the Ghanaian government completely – they are heavily indebted to a whole range of organisations, and within the seemingly narrow hallways of power they have been afforded within a system deliberately designed to limit power, they have made some terrible decisions. In fact, the Ghanaian government seems to share many of the incompetencies, failings and self-interests of the government of their former ‘colonial masters’ – in December last year the Ghanaian transport minister was forced to resign after it emerged that the government had spent 3.6m cedis painting pictures of President Mahama and other former leaders on buses. Reports of Mahama’s government lavishly rewarding officials with houses, cars and fuel on top of generous salaries feels as horrifying to me as when we discovered the British expenses scandal. I’m loathe to patronise Ghanaians – they certainly do have the autonomy to select their own government. I can’t believe that there’s noone that could do a better job than the NPP or the NDC, but then again I also can’t believe that a majority of voting Brits could elect David Cameron and his blood-sucking, Eton romping, austerity wielding, old boys club – apparently anything can happen, and people are misguided and manipulated in myriad ways. Kwame Nkrumah, “I Speak of Freedom”. Unsurprisingly, shortly after Nkrumah’s removal Ghana realigned itself internationally cutting ties with Guinea in favour of those with Western countries and allowing the IMF and World Bank to take a lead role in managing the economy. So, is bad governance really surprising when Ghana has faced attempts to limit autonomy, self-determination, self-reliance and powerful leadership at every stage of its ‘modern development’? Today the system of governance here, like the majority of national government systems across the globe, is incompetent, at least partially corrupt, self-interested and unwilling to stand up to big business, imperialism and neoliberalism. Africa has a legacy of creating great leaders who are thwarted by Western intervention and it is a sad state of affairs that Ghana, like many other countries once under colonial rule, has seemingly been forced into a self-perpetuating cycle of bad government after bad government. It seems that the collective way of operating is kowtowing to carefully marketed Western doctrine, allowing multinational corporations to eat up the country in return for a quick fix or a quick buck and putting self-interest and ‘economic growth at all costs’ first at the expense of citizens, traditional values, pan-Africanism and humanity. What’s worse is that I know most of you will be able to see these traits reflected in your own national governments as I can in mine – where the pursuit of ‘growth’ and of ‘more’ is leading us all. To frame Ghana as a ‘once African success story’ begs the question; successful for whom? Ghana is a country that has forever been considered ‘developing’. It’s poor. Since it began its relationship with the West it’s gone from slavery, to colonialism, to neoliberalism; with poverty and inequality consistent themes throughout. The only people who have truly benefited from its gold, oil and cocoa are foreign governments and companies. Ordinary Ghanaians have seen little benefit from strong economic growth. To call Ghana a ‘failure’, is also a misnomer, because actually it’s still doing exactly what it was designed to do, very successfully. If you rub off the sheen of ‘independence’, underneath is a country very much allowing largely free access to its raw materials, offering ready made markets for the sale of manufactured goods of foreign companies and allowing investment of surplus capital (to be repaid with interest). A truly successful Ghana would be a Ghana bolstered with reparations for the many damages done to its economy, its people and its resources, one that is able to exist within an international system of true equality and respect, where foreign companies and countries follow the rules instead of making them and where Ghana is allowed to invent itself however the people decide – free from the shackles of neoliberalism, imperialism and being developed in the Western image, for Western benefit. I’m not here to tell Ghanaians what they should be doing or how they should be doing it – there are enough people doing that. What I hope for with these words is to encourage those of us in the UK and in the Western world; who read articles like this one; believe in the narrative that tries to hide the fact that poverty and inequality are created; and disconnect ourselves and our lives from playing any part in it; to ask questions of these these stories. Our governments, our money, our history, our silence are all implicated in the poverty and inequality of others. Are we really surprised by the economic misfortune of a country deliberately constructed to serve foreign interests? Why is its success measured only by economic growth? How is poverty created? Who’s developing whom? Why not connect the dots? This week the UK’s YouGov published the results of a poll where 44 per cent of British respondents said that the country should be proud of colonialism. The poll comes ahead of the upcoming Oxford Union debate to decide the fate of a statue of British colonialist (murderer…racist…I could go on) Cecil Rhodes as a result of the “Rhodes Must Fall” campaign to have it removed. 59% of respondents thought that it should stay. UKIP voters and 37% of Conservative voters say Britain tends to view our history of colonisation too negatively – we talk too much about the cruelty and racism of Empire and ignore the good that it did. Young people (40%) and Labour voters (43%), on the other hand, are more likely to say we view our colonial history too positively, suppressing the cruelty, killing and injustice that went on. YouGov previously found, in July 2014, that British people tend to say the countries that were colonised by Britain are now better off for it (49%) rather than worse off for it (15%). And 34% even said they would still like Britain to have an Empire, while 45% said they would not. I’ve said it before and I’ll say it again; Britain has a very self-centric view of the world that continues to elevate it and its people as ‘civilisers’, ‘heroes’ and ‘saviours’, and traditional ‘British’ values, culture and norms as an ideal global standard. Throughout history this ‘British Empire State of Mind’ and resulting actions has led to the suffering of people the world over, the pilfering of resources and the destruction of our planet. The result today is this: globally we are witnessing increasing political and economic inequality and borders that are closed to people but open to money, and at home in the UK there is a pervasive and growing fear of immigration and xenophobia and racism. Beliefs like these are exactly the reason why I’m working with a group of people to run a series of interviews and events to challenge this mentality, and why it’s more important than ever to Rethink the British Empire State of Mind. If you agree, please join us. Get in touch via the Contact page or on Twitter @devtruths. You can read the full YouGov press release here. What do you think? Do these results surprise you? Do you agree with the 44 per cent of people surveyed who believe colonialism was a good thing? Asylum seekers, migrants, skilled migrants… screw your labels and let them in.